With a few parts from a hardware store and some know-how, it is possible to build a weapon of mass destruction. Well, as long as you can find a few pounds of plutonium on Ebay to fuel it. In 1905 Albert Einstein wrote a number of revolutionary physics papers including his Special Theory of Relativity. One of the formulas that came out of this, almost as an afterthought, was E=mc�. That is: energy is equal to mass times the speed of light squared. What Einstein was saying is that matter - everything around us we can touch and see - is actually the same thing as energy, just in a different form. The upshot of this is that it should be possible to convert energy to matter or, visa versa, convert matter to energy. A 10 megaton H-bomb test. An A-bomb ( or atomic bomb) is generally considered to be one based on the fission principal - that is the splitting of atoms. An H-bomb (or hydrogen bomb) is based on the principal of fusion, that is the fusing of atoms together. H-bombs are generally much more powerful than A-bombs. The largest A-bomb tops out at the equivalent of 0.7 megatons of TNT, while the largest H-bomb ever produced was 50 megatons. The heat and pressures needed in order to get an H-bomb's fusion reaction going, however, can only be produced on earth at the heart of a fission bomb, so in effect every H-bomb has an A-bomb as a part of its mechanism. For more information on how to build a hydrogen bomb, see our page. The energy we release every day when driving our car or cooking on a stove comes from chemical reactions. Two or more chemicals react through the motion of electrons and the forming and breaking of chemical bonds. One familiar form of chemical reaction is combustion. For example, the oxygen in the air reacts with the substances in a candle to release heat and light. In chemical reactions the amount of measurable matter involves never changes, if you were able to capture all the soot, smoke and carbon dioxide released by the candle you would find they weigh exactly the same amount as the original candle and oxygen that reacted with it. The material changed form and released energy but did not disappear. Einstein's formula suggested that it was possible to get energy by what we now call a nuclear reaction. This is the conversion of matter to energy. What's more, the amount of energy available in even a small amount of matter is, according to the formula, tremendous. Matter is just sort of a condensed version of energy, but it isn't a one-to-one relationship. The conversion factor is the speed of light (already a huge number) squared (which makes it a really big number). We can picture this relationship by thinking about water and steam. You can cool steam (think of this as the energy) down and it becomes water (think of this as matter) or heat water up to make steam. It takes a lot of steam to create a few drops of water though, but only few a ounces of water to create a whole room full of steam. The same is true of energy and matter. In the atomic bomb that destroyed Hiroshima only 600 milligrams of uranium (less than the weight of a dime) was converted to energy, but it released the same amount of power as at least 13,000 tons of the conventional chemical explosive TNT. Converting matter to energy is no easy trick, however. The sun does it naturally by a process called fusion. The sun, a gigantic ball of mostly hydrogen gas, has intense pressures and heat created at its core by its gravity. It is under this heat and pressure that the hydrogen atoms fuse to create helium and release energy. Re-creating the intense conditions required to generate fusion on earth isn't easy, however, so atomic bombs uses another process called fission. A fission reaction is just the opposite of fusion. Instead of atoms being put together, they are split into pieces. When a neutron (a subatomic particle) with enough energy hits an atom of radioactive material like uranium, the uranium atom will split into two smaller atoms and some of the energy that held the original atom together is released. If the right type of uranium is used, the split will also release additional neutrons capable of splitting other atoms. 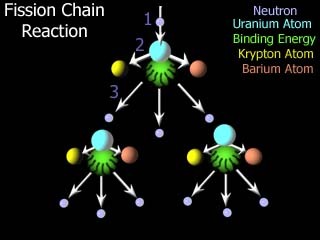 If this process continues with each new split releasing neutrons which in turn split other atoms it is called a chain reaction. Because of the speed involved in a nuclear reaction, billions of atoms can be split in a tiny fraction of a second. If the reaction proceeds at a sedate level the fission produces energy in a controllable manner. This is what is going on in the heart of a nuclear power plant. The energy released is used to heat water to the point of steam and the steam spins turbines connected to generators to make electricity. If the reaction proceeds at an uncontrolled level, however, a nuclear explosion can result. This might seem to make nuclear power plants potential atomic bombs, but the uranium used in the plants is not the type that could sustain a reaction at a rate high enough to cause an explosion by itself (nuclear power plants are subject to explosions caused by steam pressure and other non-nuclear forces, however). In fact, engineering a device that does not tear itself apart before the explosion really gets underway is one of the main design problems of building a bomb. Uranium or plutonium can be used as fuel for atomic bombs. Both are highly radioactive. This means they are constantly shedding subatomic particles including neutrons. Only certain isotopes of these materials - like uranium 235 and plutonium 239 - consistently give off neutrons of such high energy that they will split atoms. When enough of the material is put together, a chain reaction starts and the mass is said to be critical. The term used for a mass of radioactive material with a growing chain reaction, splitting more and more atoms with each moment, is supercritical. While putting enough uranium 235 together in a single mass will make it supercritical (and create a surge of radiation that will kill you if you are standing near it unprotected - see "A Supercritical Accident" below) it is not enough to create a bomb. The material must be held in a compressed state long enough for the reaction to take place while resisting the initial energy of the explosion that will try and tear it apart. There are two well-known approaches to doing this. The first is known as the "gun" method. The "gun" is the simplest way to build a nuclear weapon. The atomic bomb used on Hiroshima during World War II used this approach. The weapon consists of a tube (much like the barrel of a gun) with half the nuclear charge fixed at one end and the other half (the moving half) at the opposite end. A conventional explosive charge was placed behind the moving portion which can be thought of as the "bullet." 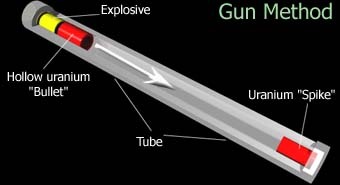 When the conventional charge is detonated, the bullet races down the tube and slams into the fixed charge at the other end (referred to as the "spike"). Once the two halves of the nuclear fuel are brought together and held together long enough, the chain reaction starts, the fuel goes supercritical and the explosion takes place. While the gun method is easy to engineer, it has some drawbacks. The biggest one is the need to make sure the two parts of nuclear fuel come together rapidly enough. As the two sections get about an inch apart, they will start exchanging neutrons that might start a chain reaction. If the two parts go supercritical before they get close enough, the force of the energy released will blow them apart before the main explosion gets underway. This type of failure is known as a "fizzle." Another problem is that this method is less efficient, requiring between 20 and 25 kilograms (around 44 to 55 pounds) of uranium. Other approaches can use as little as 15 kilograms (about 33 pounds). Given that weapon's grade uranium and plutonium are very hard to get, this is a real disadvantage. Also, the gun method only works if the uranium is being used as the fuel. The process of creating plutonium generally causes it to be contaminated with other materials which increase the chance of it going supercritical before the two sections are close enough together. This, in turn, increases the chances of a fizzle instead of a blast. To make the gun method work reliably with plutonium, you would have to increase the speed with which the "bullet" approached the "spike" significantly. To do this would mean making the tube impracticality long. For this reason, if you use plutonium to fuel a bomb you need to use the more sophisticated "implosion" method. With this approach the nuclear fuel is shaped into a sphere (called the "pit"). Conventional explosives are put around it. When these are detonated the force of the explosion squeezes the pit into a supercritical mass long enough for the explosion to take place. While the principle sounds easy, it is difficult to actually make it work. The pit cannot simply be surrounded by high explosives. The shock wave that compresses it must be precisely spherical, otherwise the pit material will escape out through a weak point. To create the necessary explosive force in a perfect sphere, shaped explosive charges (sometimes called explosive lens) are used. The "fatman" bomb the leveled Nagasaki in World War II used 32 charges arranged around the pit like the faces of a soccer ball. In order to create the spherical shock wave it isn't only necessary to get the charges in the right position with the right shape, but they must be detonated at exactly the right time. A charge that detonates late will create a hole in the shock wave through which the pit can escape. Implosion designs also require a neutron trigger or "initiator" to flood the pit with neutrons during detonation. In "fatman" this was done with a small sphere with layers of beryllium and polonium separated by thin gold foil placed in the center of the pit. 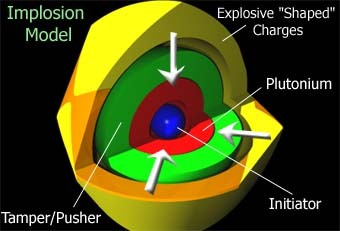 An implosion design may also include other layers between the explosives and the pit to create a more powerful explosion. These include a "pusher" (designed to increase the explosive shock wave hitting the pit), a "tamper" (to help the pit from blowing apart too quickly once the explosion starts), and a "reflector" composed of a material that will reflect neutrons back in the pit increasing the amount of fission. In some bomb designs these functions are integrated into a single layer of material. 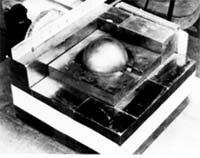 The plutonium sphere resting in the fatal testbed. In 1945 an atomic bomb worker, Harry K. Daghlian Jr, was killed while experimenting with plutonium. The test was designed to see just how much of a neutron reflector was needed to push the sphere of plutonium to the edge of going supercritical with the experimenter gauging how close he was getting by listening to a Geiger counter. As he moved the final "brick" of reflective material close to the sphere he realized he should not place it in position, but then it slipped from his hand. Daghlian knocked the brick away, but it was too late. The sphere went supercritical with a flash of blue light. He was exposed to 510 REMs of radiation and after an agonizing illness, died 28 days later. The implosion design is generally considered to be superior in almost every way to the gun design and it is the choice for any organization with the resources to design and construct it. One of the major advantages of this approach is that it is easy to make the implosion design more efficient by increasing the effectiveness of the conventional explosives. For example, if the pit is squeezed so that the density is doubled during detonation it may yield a 10-kiloton explosion. If that same pit can be compressed to three times its original density, a 40-kiloton explosion can be generated with no additional nuclear fuel. The longer the fission material is allowed to react, the bigger the explosion. Could You Build a Bomb? Building a basic nuclear weapon is not easy, but not all that hard either. In 1964 the U.S. Army decided to see just how difficult it was. They hired two professors that had Ph.Ds in physics, but no experience with nuclear weapons or access to nuclear secrets. The two were given the task of designing an atomic bomb using only information available to the general public. It took them roughly two years, but in the end they designed an implosion style weapon that could have been made in a local machine shop which could have produced an explosion similar to the Hiroshima bomb. The only thing that they found extremely difficult to do was to get the proper material to fuel the bomb: uranium 235 or plutonium 239. Only a tiny fraction of natural uranium that is mined from the ground is isotope 235 and separating it from the other isotopes is a major chore requiring huge factory complexes working years to isolate just a few pounds. In fact, most weapons programs get around this by utilizing plutonium, which is very rarely in found nature at all, but can be created by exposing more common types of uranium to radiation in a nuclear "breeder" reactor. Plutonium is extremely difficult to handle, however. It is one of the most toxic materials known to man, especially if inhaled. It is the difficulty of getting and handling these fissionable materials that protects us from people building nuclear bombs in their basements. It is for this reason nonproliferation of nuclear material is a major concern of most governments and there is great apprehension about countries who want to build nuclear reactors capable of "breeding" plutonium fuel. Knowledge of how to build a bomb is hard to control. Fortunately, so far, the materials needed have been much easier to keep track of. Video: Tsar Bomba the largest H-Bomb ever tested. Note all the information in this article has been assembled from unclassified public materials and fall short of the details necessary to build an actual weapon. This article is for information purposes only, and in no way are unauthorized persons encouraged to construct weapons of any sort.